How does an Evening at La Habichuela Sunset Looks? Cancun's only restaurant serving authentic Yucatan cuisine| Restaurant photography & review by San Francisco based food photographer at A Few Good Clicks. The Mayan King during the performance at La Habichuela Sunset, Cancun. Snag a coveted table at the custodian of Yucatán cuisine – La Habichuela Sunset on the 17mile long hotel zone. A family run restaurant, La Habichuela opened its doors in April 1977 to the locals by Armando Pezzotti R and Mary Clare Wisner. The restaurant rings the Nichupte lagoon, home to many species, dazzling sunset and a private dock. La Habichuela sunset serves a beautiful medley of Yucatan, Mexican, and International dishes, accompanied by live mariachi music and the infamous Mayan show adequate to make you feel like a Mayan King. Here are 7 enthralling reasons you must explore La Habichuela Sunset restaurant in Cancun, Mexico. It's the top restaurant in Cancun for a reason. 1. The Sunset - Little did I know that sunset watching in Cancun takes a morsel of planning, as the twilight romance happens on the Lagoon side, not at the beachfront. Thankfully La Habichuela Sunset has an outdoor courtyard with plenty of seating and natural inhabitants of the lagoon to give you company. I am not going to give away the surprise so stay with me. The sun sets every day, so this restaurant promises to be the perfect spot to watch the azure sky turn crimson resulting in breathtaking views. 2. A Strolling Mariachi band – It’s romantic setting, you are enjoying a moment with your partner, the night sky is slowly crawling in, a little bit rain starts coming down on you and before you know it, a bunch of lovely mariachi band members start singing for you. You are enjoying the moment and don’t want it to stop. This is the magic you may or may not experience but I hope, I have managed to doodle it for you. 3. Yucatan Cuisine – For the first time in my life, I had the opportunity to get acquainted with the not so known Yucatán food. So I indulged in the one the fascinating Yucatán-style chicken with achiote. For those who still can’t get over the fact that I am a full-fledged meat eater (well almost), get over it. Ok, let’s just say I am working on my seafood eating skills before I head to my South-American expedition this year. The chicken is marinated in citrus juices and achiote paste, roasted and topped with grilled onions. 3. Cocktails -This is not your swim-up imbibing spot but worth the jaunt to enjoy an experience. Cliché as it may sound to sip mango martini’s with Mayan descendants, it’s a ritual so whatever you do, just don’t forget to relish the fancy cocktails in Cancun. Their extensive lists of cocktails are enough to make the restaurant proud. 4. 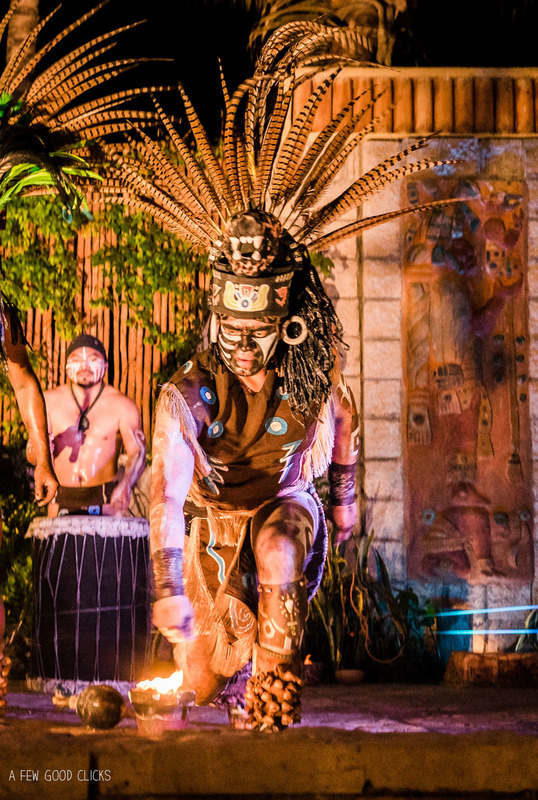 The Mayan Show - An intimate & theatrical experience of Mexico’s ancient ancestors with a delightful gastronomy. The Mayan Show transports you back to the time when the Maya race was born. Structured in 7 parts to highlight the history of Mayan culture, the show is a must see. Creation of the Human race- On a calm motionless morning, Tepeu & Gucamatz anticipated that it’s time and created men from yellow & white corn cobs. Therefore men were endowed with power and wisdom. But that didn’t gratify harbingers of the race and decided to humanizethe race by creating the women. Creation of Light – Men were created but lived with uncertainty in the darkness. With no know-how to create light, men travelled to far-flung Tulan where Tohil gave them fire with a condition to worship him. In order to show their gratitude, human sacrifices were expected and the light was created. The Sacrifice – Sacrifices started to show gratitude to Tohil but over a period of time, it became a ritual to request god of light to prevent drought, plagues and sickness. The dance of Jaguar & the Deer signifies the daily events of nature and how it was affected by the cruelty of men. The legend of X-Tabay – Utz-Colel was a very attractive but proud woman who died single because she thought no man was worthy of her. She hated her sister X-Tabay, who she considered much less beautiful, but had a way with people, which was frowned upon by their community. With the help of evil spirits, when utz-colel dies, she returns to life as a beautiful and seductive woman, uses her sister’s name ( X- tabay) in disguise and attracts lonely peasants who disappear through a super natural love affair. Mestization (Cross breeding) History – Fascinating myth that about 5 centuries ago, survivors of a Spanish shipwreck were saved by natives who at first took them as slaves. One of them Gonzalo Guerrero stayed and married the daughter of Mayan chief forming a family with 3 offsprings. Thus leading to a dawn of Mestization. During a Mayan wedding ceremony, the shaman (priest) presents the groom with seeds, copal incense, bow and arrow – a sign of responsibility of providing food and security to his family. The Dance of fire – The last act of the Mayan show is about a thanksgiving dance showing gratitude for life and all good things showered on humans by god. In many ways, ancient and living Mayan cultures are ubiquitous in Mexicans daily life. One of the elements is the Yucatan coffee. In other words, it’s the process and the skills involved in making "Flambé Mayan Coffee," that steals the show. I would say “In the Yucatán, Land of Kukulkan.” Your visit is incomplete if you haven’t tried the Yucatan coffee. Kukulkan is the Mayan feathered-serpent god for reference. The art and architecture lay the foundation of any culture and its transition through time. The restaurant houses art of Maya placed meticulously at the split-level interiors and outdoor patio. You can spot the limestone structures, faced with lime stucco which was the hallmark of Mayan architecture. So are you jealous of my adventure yet? Don't be and reserve your table at La Habichuela Sunset and share your story with me in the comments below or tweet to @afewgoodclicks.